Raging Scorpion Sword Cane | BUDK.com - Knives & Swords At The Lowest Prices! 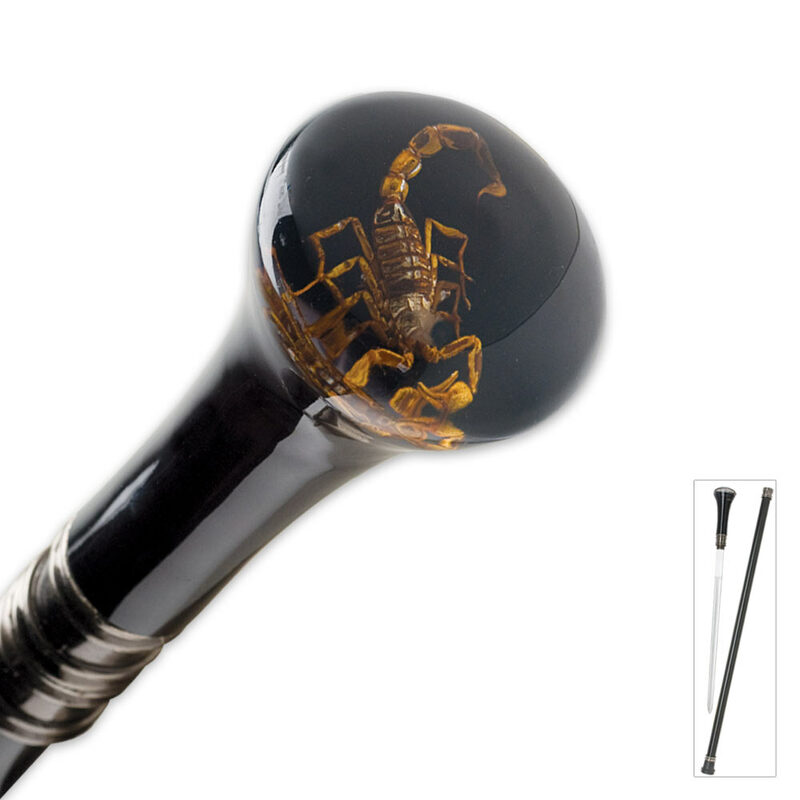 This Scorpion sword cane adds a stunning new twist on the traditional sword cane design! The handle is constructed with a clear acrylic coating allowing you to see the cold cast poly resin figure of a scorpion resting inside. This sword cane features a 15 1/2" stainless steel blade that slides into the aluminum shaft. I have only seen great things with this cane. I own it, and I seriously recommend it. This cane is solid, and seems to be the finest quality. I trust this line and the manufacturer knows what they are doing! I liked it for a sort time .The handle chipped .That I polished it smooth .Next I Stabbed a cardboard box .Could not pierce the box .Blade too thin . I then made a BIG mistake I tried to slice the box ; the handle shattered at the base into 3 pieces Showing a small screw .I glued it back together . Useless for cutting .I had my doubts about it as a cane before .Now I'm sorry I did not return it the day I got it. I bought this cane to help me walk better and to have a means of defending myself. The cane itself is a formidable weapon but here's a trick I learned. If someone confronts you, put the cane into the palm of your hand and start lightly tapping while at the same time, start unscrewing the sword. It only takes a few seconds to unscrew the sword and pull I out. IF YOU DON'T HAVE ENOUGH TIME, SWING THE CLUB WILDLY LIKE A CLUB. i just bought the raging scorpion sword cane and I am thrilled with it. I use a cane and this one feel's sturdy too me.It could be a little longer but I like it. I received the cane on 8 Dec 2013 and had it resting against the wall and it rolled off, fell on to a carpeted floor and the acrylic handle broke off. I noticed just a very short screw that was holding it on. The screw is way too short for the weight of the handle. I super glued it back in place bit like anything broken it probably will not ever be as strong. I purchased this as a gift for a friend who uses canes. It is an attractive cane, and it seemed sturdy enough to help him maintain his balance. Access to the sword is slow requiring it be unscrewed from the shaft. So if yur looking for a handsome cane at a discount price, this one may work for you. I bought this for my dad as a Christmas gift, the cane is sturdy, the blade is a lower quality blade but it will defend you. The scorpion in the hand was not the best, I am from Arizona and we see scorpion in all kind of items from necklaces to paper weight and this one was about the worst one I ever seen. But for the price it is an OK walking cane.